The parsleyworm is quite spectacular as caterpillars go. It is colorful and it is big. It is a 2 inch caterpillar that is green with bright yellow-dotted black band across each body segment. It gives off an odor and projects orange horns when it is upset. 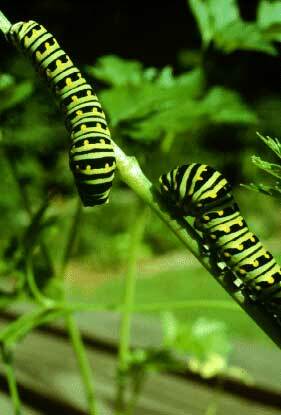 It is the larvae of the black swallowtail butterfly, another beautiful creature. They are black with yellow spotws on the edges of their wings, a taillike projection on the hind wings, and a 3 inch wingspan. They are found all over the United States. The adult butterfly lays white eggs on the leaves of the parsley plant or on some relative to parsley such as celery. The eggs hatch and turn into pupa which winters over in debris of some kind. Several generations occur each year. 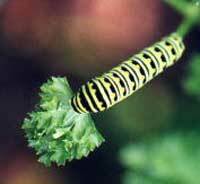 Parsleyworm will eat the foliage and stems of plants in the parsley family including carrots, celery, dill, and parsnips. Chunks of leaves taken from along their edges are typical signs of parsleyworm attack. Often only stems remain. In a very short period of time, parsleyworm can defoliate a small plant. How Many Make a Problem? - Just because you see one caterpillar, do not panic. A few Parsleyworm cause little damage and are food for the birds. Also those Parsleyworms turn into what we consider to be the pretty black swallowtail butterflies that many of us want in our yards. What you look for is the damage. When you can notice that almost 1/4 of the plant is damaged, then some action is definitely necessary. As we note in most of our pest insect files, most insect problems, including caterpillar problems occur after a plant has become stressed for some reason. Healthy plants can usually handle a few Parsleyworm wandering around chomping here and there. A plant that is in stress however, seems to have an alarm system sounding that attracts lots of Parsleyworm at one time. So if one of your plants is attacked by a bunch of Parsleyworm, deal with the insect problems, and then spend a few moments trying to figure out if maybe there is something you can do to relieve the stress problem.